Discussion in 'Civ5 - Custom maps' started by Gedemon, Nov 8, 2010. City-States separation : minimum distance between CS and other civs. This will not be used when using the Totally random option, and will replace randomly a CS with TSL that is placed under the minimum distance when using the Random and TSL option. When you use it with the other options, the script may not be able to place as much CS as selected in the top slider. Bosphorus Strait is a sea : place a sea tile between the Black Sea and the Aegean Sea. If not checked, a river will represent the Bosphorus and Dardanelles straits. Remove United States from game : if you want to use a random selection of civs and be sure that the USA won't be present in the new world 2000BC, then this option is for you. If you choose to play at the USA, this option will have no effect. Add major deposits of strategic resources : will try to place the deposits defined in the ResourceRegionPos.xml file. Currently, all major oil and coal deposits are defined (see the <Resource_YagemGisementPosition> part of the XML). Use true geographic resource placement : this option will prevent some resources to be placed in the wrong region. For example, Ivory will only be found in Africa and South-Asia, you won't find spice or silk in europe, no horses in America, etc... The region position are defined in the ResourceRegionPos.xml file, and the resource exclusion is set in the ResourceRegionExclude.xml file. Add specific resources at starting positions : Place resources (set in the CivilizationsRequestedResource.xml file) for each civilization. You can set up to 5 resources to be placed for each civs. The realistic random resource placement options are only available for the giant and huge maps. 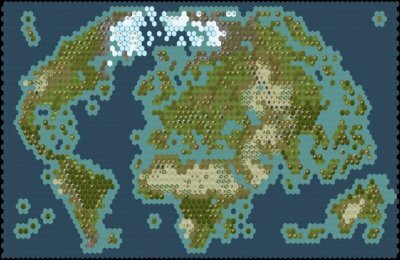 - Yet Another Giant Earth Map (180x94) : edition and convertion of Genghis Kai GEM for civ4. Quadcore CPU and at least 4 gb of RAM on 64bit OS are recommanded to use this map. - download the civ5mod file to your mod folder (..\My Documents\My Games\Sid Meier's Civilization 5\MODS). 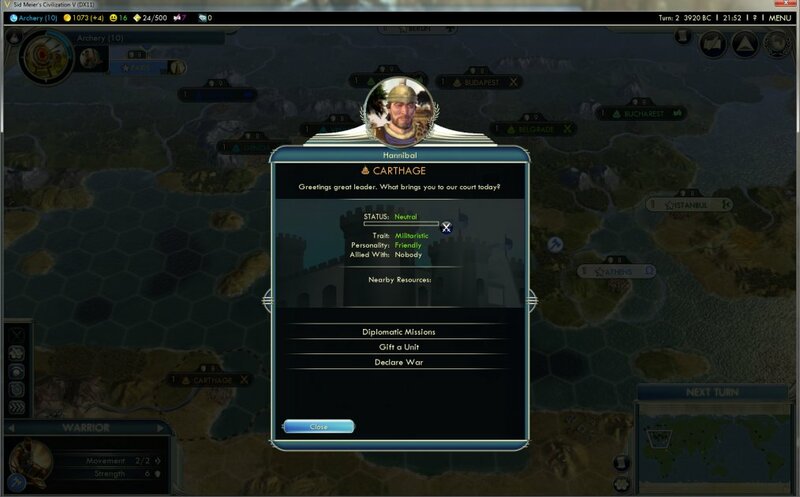 - launch civ5, go in the Mods menu and wait a few seconds for the files to be extracted. If the automatic extraction is not working, use 7zip to manually extract the mod (the .civ5mod file is a 7zip archive) in the mods folder. - find the "Yet not Another Earth Maps Pack" line and activate the mod. - Ynaemp City States for vanilla Civ5, without overlapping start positions and less CS to give more place to European civs. - Ynaemp City States Extended, with 45 CS with TSL. Due to game engine limitation, only 41 can be loaded in game, and on those, some may be erased at start because of overlapping start location. - Some files may need to be merged : MapGenerator.lua and WorldBuilderRandomItems.lua if they are used by another mod. - This mod reinitialize and change 3 resources table : Resource_TerrainBooleans, Resource_FeatureTerrainBooleans, and Resource_FeatureBooleans. Any mod updating those tables should be loaded after this one. - Since version 0.2, the YnAEMP City state Leader mod does not override any file. you can add a TSL for any custom civ by editing the CivilizationsStartPos.xml file (or MinorCivStartPos.xml for a city state). - the civilization type name (like "CIVILIZATION_ARABIA") that you'll find in the custom civ mod files. - the tile location of the map you want to use it in. 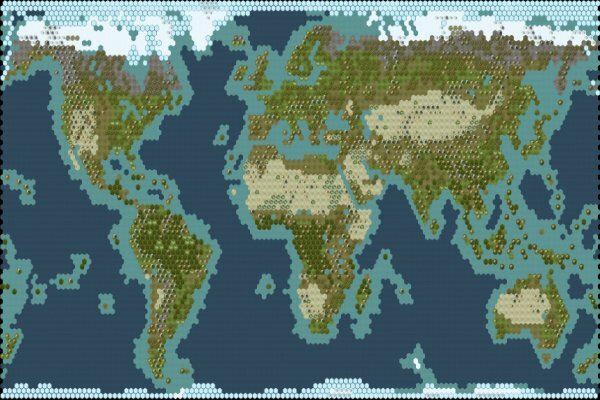 for example, if you want to add the dutch TSL on the giant map, open Earth_Giant_blank.Civ5Map in the world builder, locate the plot here (edit plot tab) and note it (I'll use plot 16,70). save your change and try to start a game selecting the Dutch, if all civs start at random pos, then you may have made a typo in the XML file. you're limited to 22 major civs in game atm, if you have all the DLC then you'll have at least one civ missing in game if you use any custom civ. This way YnAEMP will create the needed table in the DB before your mod is loaded. Then you just need to add the XML code in one of your files to add the position of your civilization in YnAEMP tables. If the game crash when loading the giant map, try the old version, aka YAGEM (loaded the "normal" way, ie mod -> single player -> set up game -> choose map). If this version alone lead to a crash, then you're probably limited by the the actual civ5 executable and/or your hardware. - Enable lua loging : open the config.ini file (in "..\My Documents\My Games\Sid Meier's Civilization 5") with notepad or any other text editor, find the line with "LoggingEnabled = 0" and replace by "LoggingEnabled = 1"
Minimum Civ5 patch version required : 1.0.1.217, I can't provide support for older version of Civilization V.
All the vanilla civs (including Babylon and Mongolia) starts at the good place. I understand that if you use the correct option that will not be a problem. in fact, I don't really understand the question : can you describe how you get the civs starting at the wrong place using that mod ? I have one sugestion, when I start a game, I like to pick the civs that will be in it, and I always use one of two selections, either ancient civs (Rome, Greece, Egypt, Babylon, Persia, India, China, Japan, Aztecs and maybe Iroquois) or more recent civs (America, France, Germany, England, Arabia, Ottomans, China, Japan, Siam, Songhai, India). So yesterday I tried your mod with the ancient selection, playing as the Romans, and CS in TSL (love that one), got 3 CSs in northern Italy, one of them couldnt even build a city because it was too close to Rome, and then there's the problem of having more recent CSs mixed with ancient civs. So my sugestion is, add an option to only use one of these selections, with perhaps Americans and Iroquois as options in 2nd selection. If im playing as Americans I would like Iroquois to be there too so im not playing alone in N. America, but I suppose they could also be converted to a CS. Then, add a few more CSs so we could have a nice list of both ancient and more recent CSs. I can help with ideias if you want to take my sugestion. 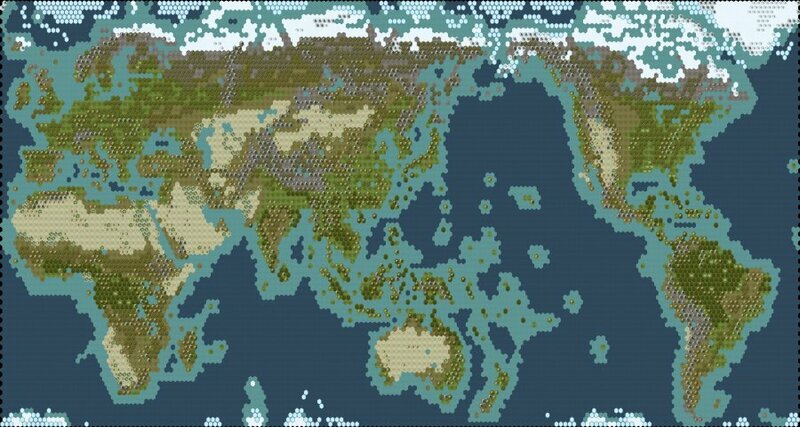 The idea is, if playing a game with ancient civs, only ancient city states are placed on the map. If playing with more recent civs, only more recent CSs are placed, plus some others that were still around in renaissance times Also logical would be to create CSs to represent Rome, Athens and Alexandria for instances, since they're no longer full civs in the 2nd selection, they should still be on the map as CSs. 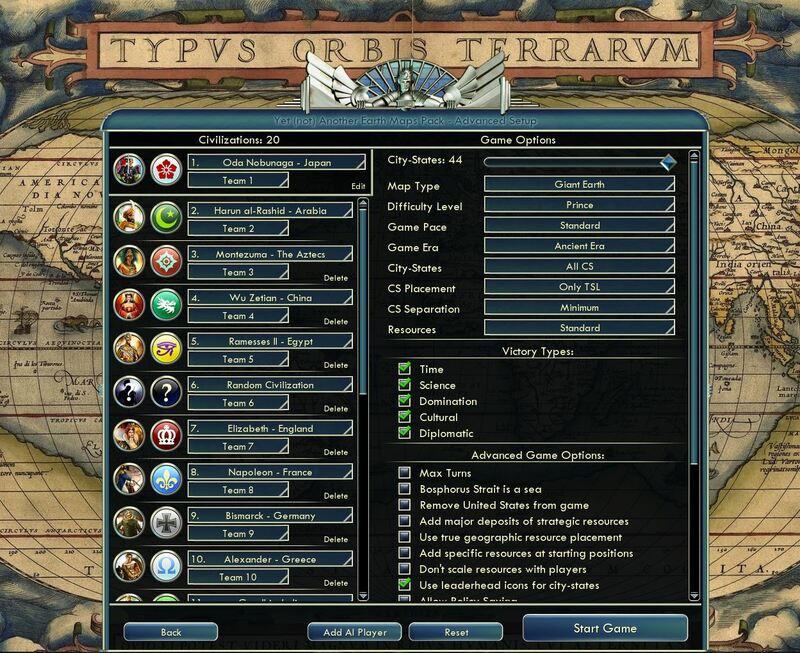 I have one sugestion, when I start a game, I like to pick the civs that will be in it, and I always use one of two selections, either ancient civs (Rome, Greece, Egypt, Babylon, Persia, India, China, Japan, Aztecs and maybe Iroquois) or more recent civs (America, France, Germany, England, Arabia, Ottomans, China, Japan, Siam, Songhai, India). So yesterday I tried your mod with the ancient selection, playing as the Romans, and CS in TSL (love that one), got 3 CSs in northern Italy, one of them couldnt even build a city because it was too close to Rome, and then there's the problem of having more recent CSs mixed with ancient civs. which separation setting did you use ? normally the default (minimum) should prevent a CS starting so close of another that it can't settle at it's starting position. Only the "no check" option should lead to such a case, so maybe it's a bug that I need to check if you can confirm it. yep. on a side note, the civs are placed before the CS, if a civ and a CS representing that civ are loaded (let say Edinburgh and Scotland custom civ - and if Scotland TSL is set in the XML), then the CS will be removed from the game leaving only the civ if you don't use the "no check" option for separation. Thats cool Gedemon! Good luck with the resource placement thing! - the second is Use true geographic resource placement, this option will prevent some resources to be placed in the wrong region. For example, Ivory will only be found in Africa and South-Asia, you won't find spice or silk in europe, no horses in America, etc... The region position are defined in the ResourceRegionPos.xml file, and the resource exclusion is set in the ResourceRegionExclude.xml file. but if I manage to do the code part, with a small exemple (let say a part of europe), then it's just a question of "who want to edit a few tousands of XML lines ?" I'll take a look at the new version now, the resource thing seems excelent! Gedemon, I have no time for this at home, but I can do a few things at work, so im working on an ancient CS selection. I already made a list of CS for America, Africa and Europe, other regions will follow. Then I'll add them to the MinorCivAdded xml file. However im going to need some help with the MinorCivStartPos xml file, I dont have worldbuilder so I know of no way to determine the X Y locations for them. I'll post the list of CS soon. By the way, I believe its Ile Ife, not Ife Ife That one is included in my African CSs too. Ahh.. your already fixing the citystates? normally, the "preselected" option will place 26 civs on the giant earth map, all of them being far enough of each other. When you use the "Only TSL" option on the giant map, you'll get up to 40 CS placed, depending of your separation option. With the "no check" option for separation, you'll end up with some CS not able to create their first city... Using the "Only TSL" option, you should set the separation to "minimum" or "close", then you'll get Tyre or Sidon on the map, but not both... note that with the minimum separation option Europe will be crowed. I thing that with the resource code done now (I'll post the new version after a few test when I get back from work) I'll move the preselected table to XML for easier editing. Anyway, I'll put more preselection, starting by Madeira's one I hope ! edit : like it ! You can set which resources to place at starting position of each civilization by editing the CivilizationsRequestedResource.xml file. The XML is a kind of a draft to test the function, feel free to edit it at your taste or propose change here.